George Osborne will meet media agency bosses next week after taking up the editorship of the London Evening Standard today. The former chancellor, who is standing down as a Conservative MP, is thought to be keen to woo advertisers in his first week in the job. Sources say Osborne will meet media agency leaders on 8 May, followed by agency heads of investment and partners from brands in the coming weeks. He edited his first front page today after pledging to be "independent" in his new role. Today’s splash (above) reported that the European Parliament’s chief Brexit negotiator has openly mocked Theresa May. Osborne’s appointment in March prompted outcry as he was still the MP for Tatton (having taken the job before the general election was announced) and had recently accepted a £650,000 job as advisor to Blackrock, the US investment company. The former Conservative politician had already met with the ESI Media ad sales team, as well as journalists when he visited the newspaper’s offices in Kensington in March. 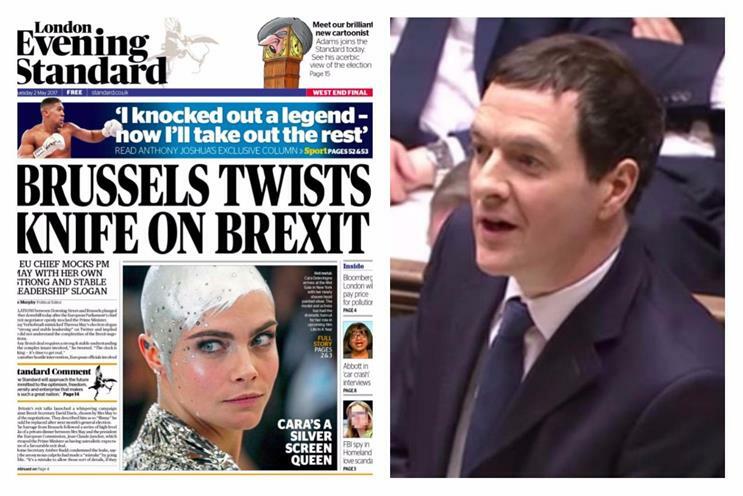 The Evening Standard’s commercial chief, Jon O’Donnell, told Advertising Week Europe in March that Osborne was "keen" to work with the commercial department and would provoke interest among advertisers. London black cab drivers protested outside the Evening Standard’s office today, following reports that, while he was chancellor, he intervened to stop then mayor Boris Johnson from imposing stricter controls on Uber, the taxi-hailing app. Editor's note: this article originally reported George Osborne would meet media agencies on 5 May. ESI Media subsequently clarified this would, in fact, happen on 8 May.